Rockstar Coconut Water is part of their hydration line and a way to jump on the coconut water health trend. Their coconut water, of course also comes with a jolt of caffeine. The taste takes me back. The first scent and sip of Rockstar Coconut Water wisps me back to my time in Thailand and the Pacific Islands, where they chop off the top of a fresh coconut and then stick a straw in it. It's non-carbonated and is lightly sweetened. It has just a slight energy ingredient aftertaste, but not enough to be a turn off. The energy is much like other Rockstars. I got the pretty standard Rockstar lift from Coconut Water and a few of the ingredients impressed me. While they only use 10 percent coconut juice, they do add natural flavors to give it that authentic taste. I was glad to see artificial flavors weren't used. I also was impressed to see natural stevia listed as a sweetener and not any of the usual artificial ones. If you like coconut and/or coconut water, I think you'll like this Rockstar. This drink would be perfect for a hot, sweaty day. Just don't rely too much on the hydration part as caffeine is a diuretic and will cause your kidneys to eliminate water from the body. 16 Pack - Starbucks Refreshers with Coconut Water, Black Cherry Limeade - 12oz. 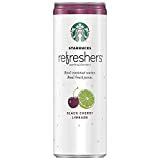 9 Pack - Starbucks Refreshers with Coconut Water, Black Cherry Limeade - 12oz. 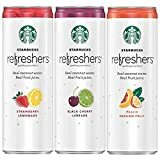 6 Pack - Starbucks Refreshers with Coconut Water, Black Cherry Limeade - 12oz. PURIFIED WATER, SUCROSE, COCONUT JUICE, TAURINE, NATURAL FLAVORS, PHOSPHORIC ACID, SODIUM CITRATE, CAFFEINE, PECTIN, SORBIC ACID, CITRIC ACID, CALCIUM PANTOTHENATE, NIACINAMIDE, PANAX GINSENG EXTRACT, MILK THISTLE EXTRACT, PYRIDOCINE, HYDROCHLORIDE, STEVIA, CARMEL COLOR, CYANOCOBALAMIN. How Does Rockstar Coconut Water Compare? Rockstar Coconut Water contains 10.00 mgs of caffeine per fluid ounce (33.81mg/100 ml).